Walking the parapet on the roof of the first floor casino. Right above the “quiet bar” is where there used to be a series of what I called FakeDoors™. The FakeDoors™ are long gone, but in the their place are FakeWindows™. 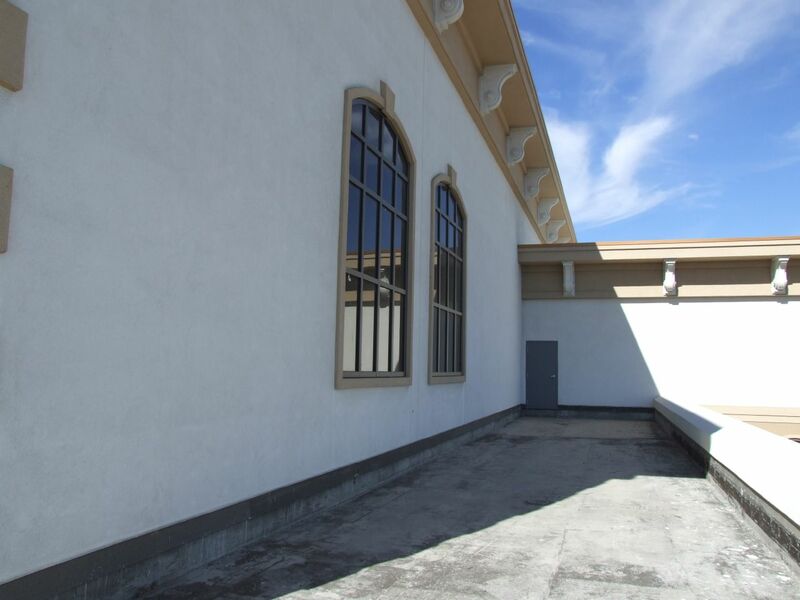 These windows on the second floor are painted over and only open into the back-of-house service corridors next to the ballrooms. So they’re not there for light, they’re just there for looks. 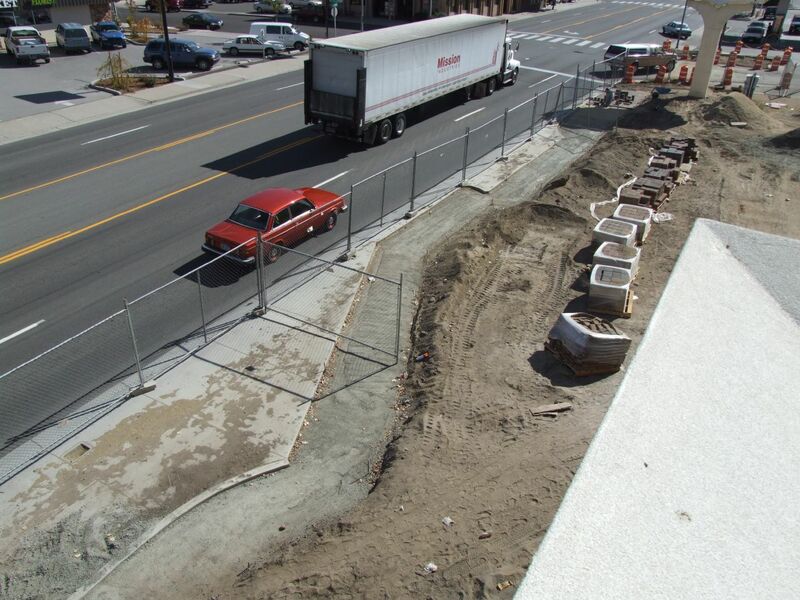 From the parapet you can look down and see where they were working on the sidewalk. You can also see the turn lane and driveway you’ll use to get under the portecochere and into the valet parking. The Grand Staircase. 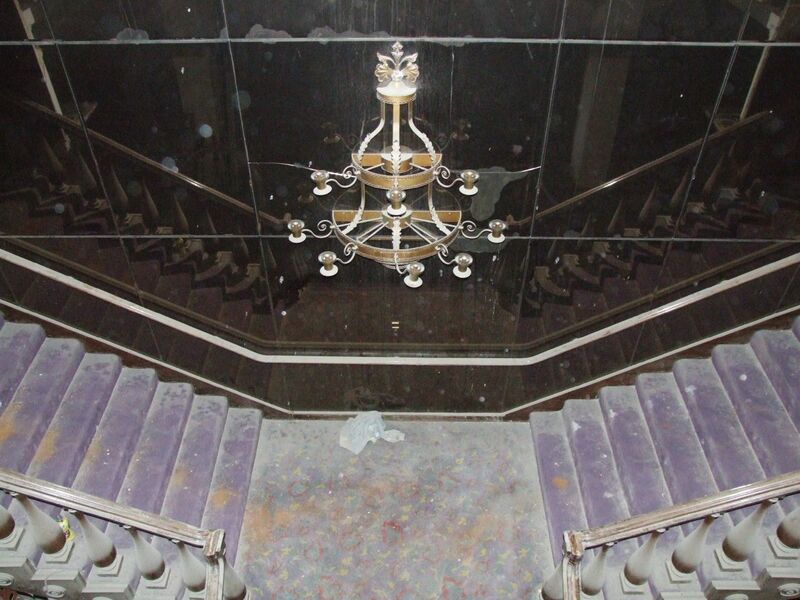 This staircase takes you from the casino floor up to the second floor dining areas. It’s the one thing from the original Ormsby House that is being saved. And for good reason. Not only is there some great woodwork here, it’s also one of the things people remember most about the Ormsby House. If the mirror was clean, this half-chandelier would magically become whole. 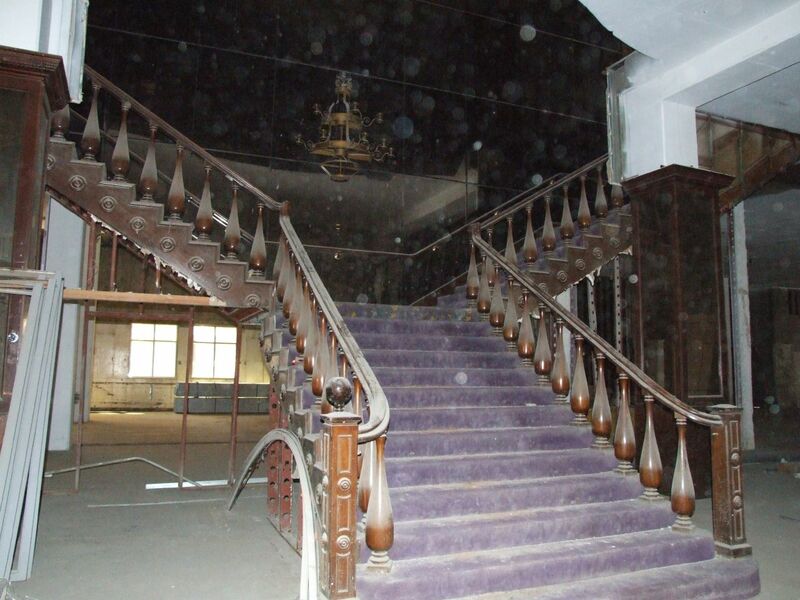 But everything on the staircase is pretty dusty, dingy, and covered in pigeon poop. The original purple carpet is still here, but I’m thinking it will be replaced before opening. I used the flash to shed light on this area that’s been in the dark for years. It’s like diving on the Titanic. Inside the casino are pallets of our old friend FakeRock™. Now, I know the rock isn’t really fake. It’s actually native sandstone from the quarry at the state prison. This is the same kind of rock that was used on the State Capitol, the US Mint, the Courthouse buildings on Carson Street, and the long-lamented Orphan’s Home and V&T shops. 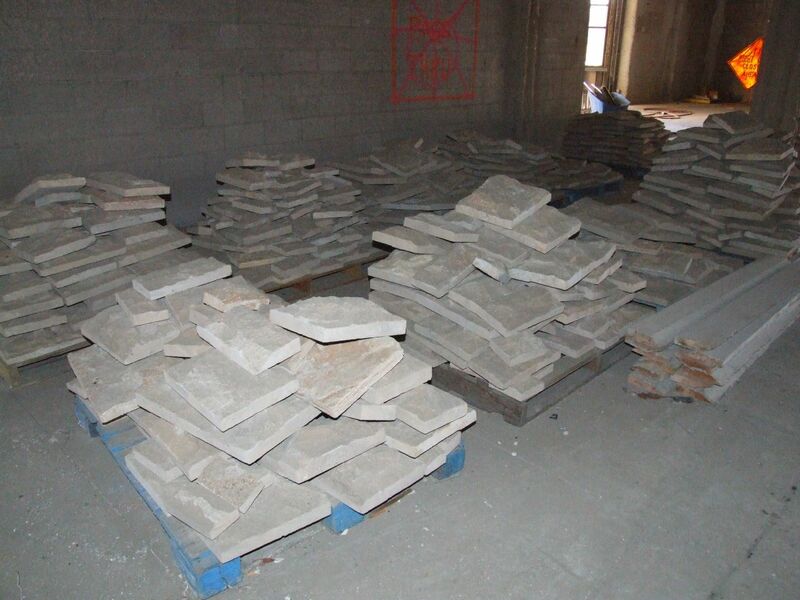 These slabs of stone are being sent back to the prison, pallet by pallet, to be sliced in half, cut more precisely, and polished so they can be used in future construction. I only call it Fake because it’s a veneer, a purely decorative rock attached to a block wall. 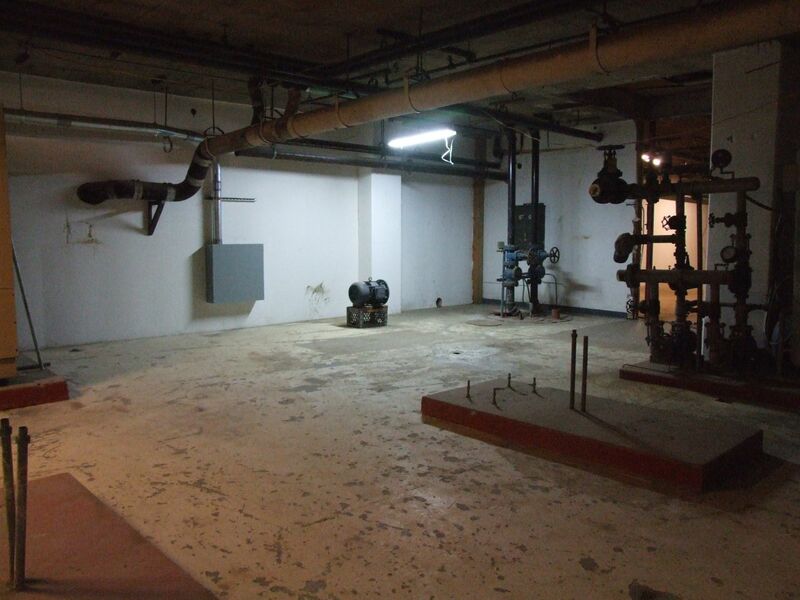 Another area that’s off limits to most guests is the basement of the Ormsby House. In fact, most people probably don’t know there is a basement. It’s not under the entire building, though. It starts at Curry Street and stretches about a third of the way into the casino. It’s mostly empty right now, except for a few mechanical pieces. 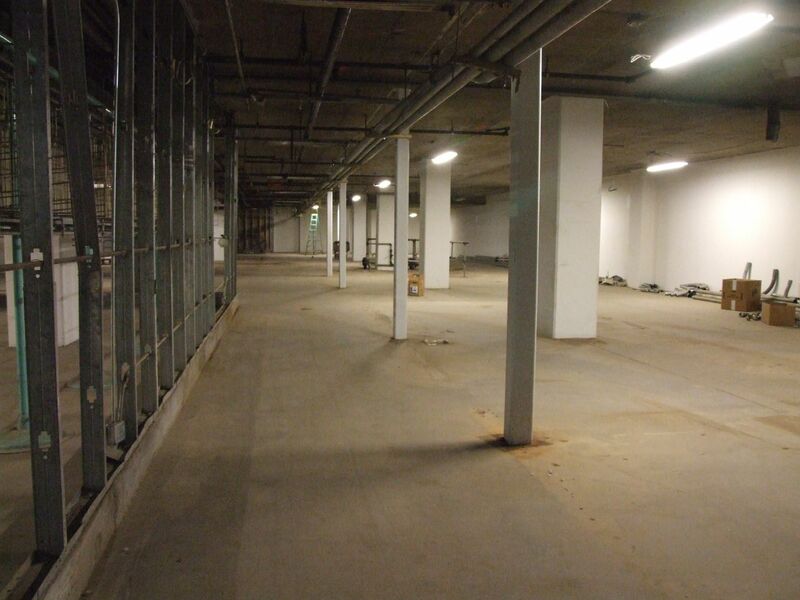 In the future this will be home to the hotel laundry, among other uses. Over the years, the Ormsby House had sprung a number of leaks, and all the water eventually found its way down here to the basement. So when the hotel closed in 2000, this was a dark, dank, scary place with puddles of standing water everywhere. The walls have been knocked down and the water dried out, so it’s a little more inviting down here now. Doesn’t mean I’d want to be here at night, though. 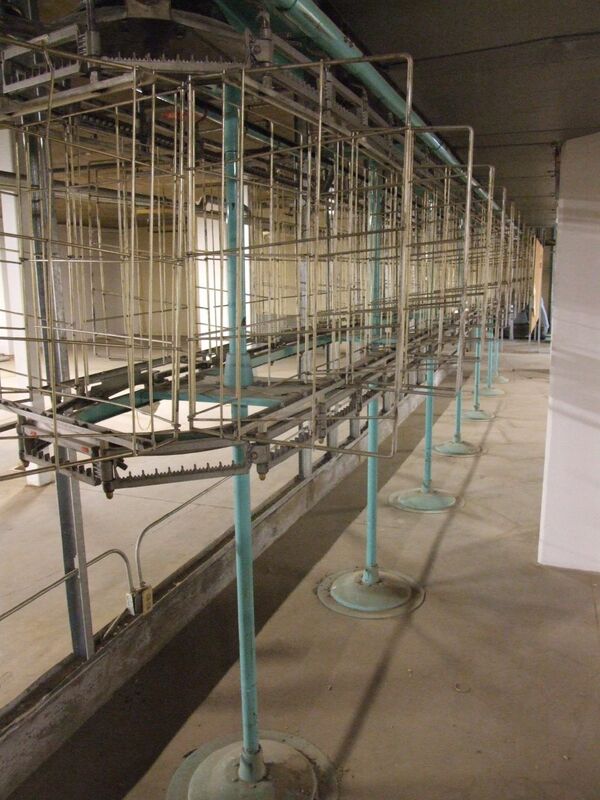 This piece of equipment was part of the old laundry operation in the basement. The owners don’t even know how it works. After our tour of the Ormsby House was finished, we went over to the Ormsby Club, which is operating in the lower level of the parking garage. This little bar and casino hasn’t been nearly as popular as the owners had hoped, so many of the slot machines that were on the casino floor on opening day have been taken out of service. 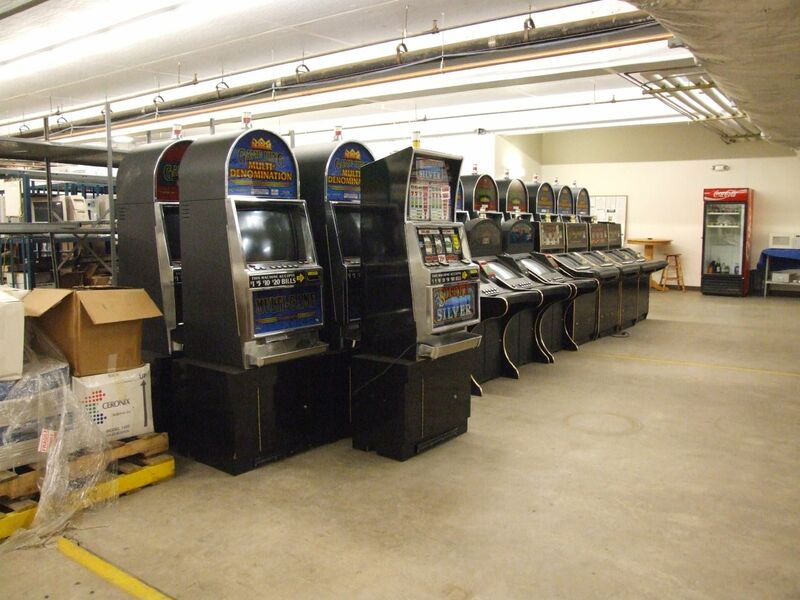 Here they are in a storage room in the back. Oh, this is the best part. Even after a top-to-bottom tour of the Ormsby House, I was still excited to find this tucked away on a shelf in the back of the Ormsby Club. This copper sculpture is a representation of the original Ormsby House, the one built by Major Ormsby himself at the corner of Second and Carson. You can see a picture of that Ormsby House here. I can remember this model from when I was a kid. 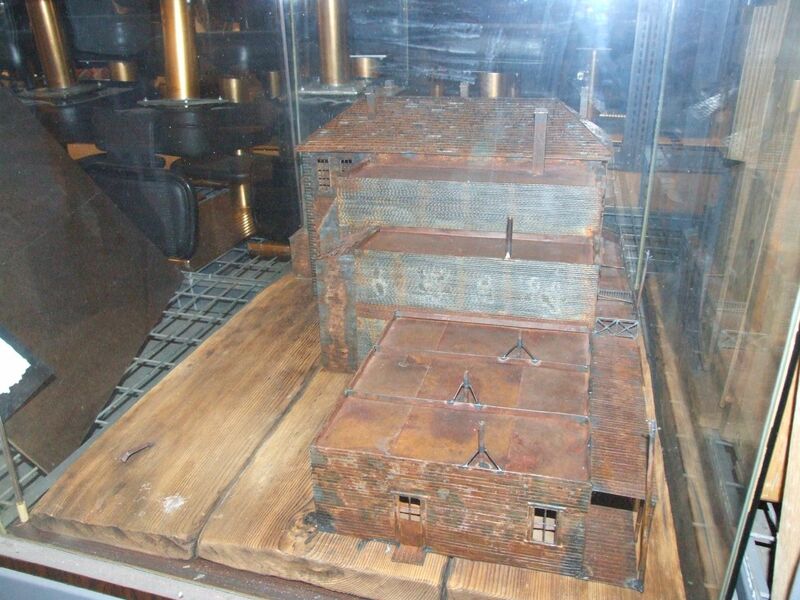 It was on display at the top of the Grand Staircase, and we would study it when we were waiting in line for the buffet. At the time I had no idea the original Ormsby House had been demolished; so I was always trying to match up the model to the building I was currently in, and it just wasn’t adding up. I had hoped this piece wasn’t lost with the new owners and all the demolition. And no, they’ve kept it safe all these years, along with its original sign. I told them that this piece should be out on display inside the Ormsby Club, where everyone could see it. Maybe they’ll take my advice. 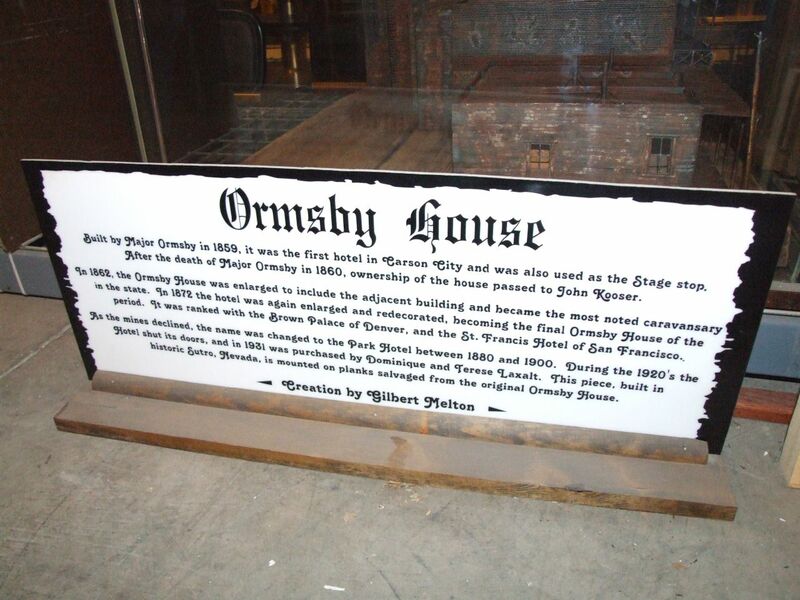 And hopefully when the Ormsby House itself reopens, they’ll give this model a place of prominence in the lobby, as a link to the past and a reminder of where the Ormsby House came from. This piece may still be in storage, but at least I can bring it to light here on the web. Here’s what the inscription on the sign says. Built by Major Ormsby in 1859, it was the first hotel in Carson City and was also used as the Stage stop. After the death of Major Ormsby in 1860, ownership of the house passed to John Kooser. In 1862, the Ormsby House was enlarged to include the adjacent building and became the most noted caravansary in the state. In 1872 the hotel was again enlarged and redecorated, becoming the final Ormsby House of the period. It was ranked with the Brown Palace of Denver, and the St. Francis Hotel of San Francisco. As the mines declined, the name was changed to the Park Hotel between 1880 and 1900. During the 1920s the Hotel shut its doors, and in 1931 was purchased by Dominique and Terese Laxalt. This piece, built in historic Sutro, Nevada, is mounted on planks salvaged from the original Ormsby House. I hope you enjoyed this tour of the Ormsby House. By climbing around inside the building I really got a sense of how much work there is to be done. But also, during the entire tour, which took place on a Wednesday afternoon, we only came across about five workmen. So yes there’s a lot to be done, but if they throw a large enough crew at it they could make progress quickly. So even after my tour I’m still frustrated with how slowly this remodeling is going. Let’s get some bodies in there! The owners say that there are a lot of things ready to go. They’ve got a stack of plans drawn up, and the plumbing and electrical should be going out to bid soon. If there’s a lot of work going on over the winter, I’ll try to arrange another tour next spring to see the progress. But until then, keep checking back for updates!